As results of the 2016 presidential election poured in last November, my Twitter feed was clean. I didn’t see any hint of who was ahead, and I didn’t know who would be the next U.S. president until much later the following day. As I walked into the dining room on board Hurtigruten’s expedition liner, Fram, all I could see were pale blue icebergs flanking either side of the ship. We were slowly nearing Antarctica, making our way through Iceberg Alley, the gateway to the lower latitudes. The ship had Wi-Fi, but part of the reason we were on board was to get away from technology, especially during the election. Someone finally braved the explosion of reactions on social media to check the results of the election, and then quickly shut off their phone right after. News of Trump’s triumph slowly made its way around the dining room the old fashioned way: word of mouth. Pew Research Center estimates that 84 percent of adults in the U.S. are connected to the Internet and 68 percent are constantly attached to their cell phone, making the concept of a digital detox so popular—and necessary—these days that January has been dubbed “Digital Wellness Month.” The Spa at Mandarin Oriental, Miami even payed tribute to the concept with a new digital wellness program with day-long retreats designed to “disconnect and re-evaluate your relationship with technology.” The idea is to create a routine of digital balance, shutting off from technology and switching your focus to mindfulness exercises like meditation and journaling. Guests can even relieve the stress and strain from all those hours logged at a laptop with spa treatments designed to ease your hands and shoulders of tension from typing. City escapes like this are one way to switch off, if only for a day, but travelers are now looking to get even further from technology, taking a breather in some of the most remote corners of the globe from the end of the Americas in Torres Del Paine National Park to the lowlands of Vietnam. As the Vietnamese government has lifted travel restrictions in the northeastern region of Hà Giang, Vietnam, along the border of China, now’s the time to jet off and experience a taste of this time-trapped tribal culture. Ride & Seek has launched a 10-day Vietnam Bike Tour that weaves through the 5,000-square-mile province that’s made up of 22 ethnic minorities, with rides of up to 100 miles per day through terraced rice paddies and villages where you’ll be able to connect with the locals in ways that don’t require an app. For an even more remote stay, switch off in style at Three Camel Lodge in Mongolia. Sleep in one of 40 handmade gers, or traditional nomadic herder felt tents, looking out across the Gobi Desert and its mountains, with an opening in the center (used as a sundial by nomads) that’s perfect for stargazing in bed. A stay here is secluded enough, but the trek to the tents is what really gives the feeling you’ve disconnected from society. From the capital of Ulaanbaatar, you’ll have to take a 1.5-hour flight to Dalanzadgad at the edge of the Gobi Desert. Then it’s another 90 minutes by 4×4 on an off-roading trip to the lodge. Serving as a base for archeologists and filmmakers, Three Camel is equal parts eco lodge and luxury escape with a modern take on traditional gers, featuring stove heating, fully equipped private bathrooms, and locally made amenities like bathrobes and Mongolian felt slippers. Playing on the theme of escape, the lodge is telephone- and Internet-free, which means you won’t be able to immediately Instagram images of your Mongolian feast at the Bulagtai Restaurant, which serves up slightly Westernized versions of traditional fare using organic produce from nearby farms and dairy from local nomadic families that’s pasteurized on site. When the sun starts to set, snag a pre-dinner drink in the main lounge, Dino House, modeled after a traditional Mongolian sum, or temple, with veranda views across the desert and local drinks like American-inspired pale Golden Gobi beer. Just outside of Torres del Paine National Park in Chile, you can find a luxurious escape of another sort sitting on 100 acres bordering the Fjord of Last Hope. 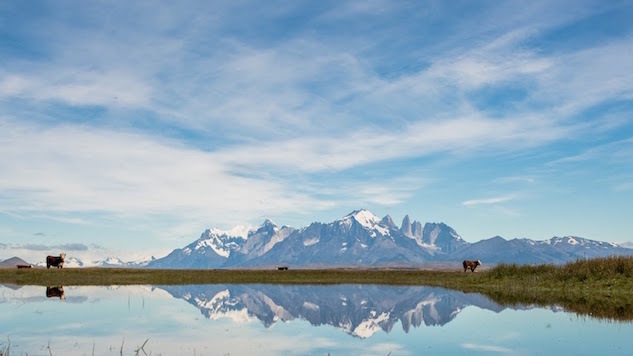 The Singular Patagonia celebrates travelers whose pioneer spirit brought them to the area to start a new life. The five-star hotel housed in a former cold storage plant acts as a living piece of history, as well as a prime launch pad to explore the nearby park. All 57 rooms and suites show off expansive views of the Patagonian fjords, which you can easily set off and explore on the resort’s personal speedboat. The scenery is really the star of the show here, with sailing trips around the nearby Serrano and Balmaceda glaciers and treks to the Mylodon Caves, where archeologists have found presence of human existence dating back to 12,000 B.C. After you’ve gotten a bit of a mental escape, head back and indulge in dinner on par with some of the best restaurants in the world with a locally fueled meal prepped by Chef Laurent Pasqualetto, who has worked in some of France’s haute eateries like Fouquet’s on the Champs-Élysées in Paris. At the restaurant, you’ll see just how much of an impact the surrounding landscape plays on the cuisine here with revamped favorites like Patagonian hare and South American king crab served alongside wines sourced from each of the country’s grape-growing valleys. Lane Nieset is a freelance travel writer based out of Miami, Florida.